In the Ojibwe world view, the Great Spirit placed original man on earth, and the wolf became man’s guide and brother. Tovar Cerulli explains that this spiritual understanding of the wolf can also be considered in secular terms, and that all of us—including wolves—might benefit if we did just that. In part 2 of this real-life story, wildlife biologist Dave Mech continues his entertaining description of methods used by scientists to track, study and ultimately help preserve various species of wildlife. The process has changed dramatically over his lengthy career, going “from ear tags to armchair” with advancements in tracking technology. (Find part 1 in the summer 2017 edition of International Wolf.) Download full article. the other ways they share essential messages that keep the pack together, and foster safety and survival. It is a great honor to recognize Heidi Pinkerton, who has become a core member of our pack at the International Wolf Center. It was ambassador wolf Maya and her untimely death in 2011 that drove Heidi to seek the solace of the Northern Lights where the night sky illuminated a broad spectrum of colorful particles. Accompanying the night show was the alluring howl of a lone wolf. The end result is a stunning “Howling from the Heavens” photograph that graces the walls of the Center in the memory of Maya. arise within a wolf pack. Wolf care staff members conduct daily checks of the wolves’ physical conditions and deliver a variety of nutritional supplements—and when necessary, prescribed medications—365 days a year. But the presence of the wolf care staff can influence pack dynamics as individual wolves compete for staff attention. Lisa Nivens will not only pass the mustard, she’ll include the spicy BBQ sauce, the hot sauce and the ketchup! For 13 years, Lisa has worked for The French’s Food Company, calling on restaurant chains such as Chili’s and Hardee’s as the national accounts manager. She regularly partners with restaurant culinary and marketing teams to customize new sauces or menu items. An Australian-led study meanwhile asks, Are humans inadvertently creating a new wave of wolves that are domesticating into dogs? Thomas Newsome, who was on the team studying the relationship between wolves and golden jackals reported above, was lead researcher in this study, released in the journal BioScience in April. Newsome, of Deakin University and the University of Sydney in Australia, reports on his website that he and his colleagues used case studies of gray wolves and other large predators to explore the effects of foods, found as a result of human presence. In Mongolia, a traditional livestock guard dog, the Bankhar, is being brought back to protect the nomads’ herds. Bruce Elfstrom, a biologist interviewed by the English-language Nikkei Asia Review, says he was producing a documentary in 2004 on the steppes of Mongolia when he was roused in his yurt by the sounds of wolves outside killing nearly 50 animals belonging to local herders. In the Netherlands, a dead male wolf in Drenthe (in the country’s northeastern part, near the border with Germany) was apparently hit by a car in April. If the wolf was killed in the Netherlands, it would indicate that the animals are moving back into the country. In Scotland, the Trees for Life charity has recruited a group of volunteers to stalk the woods pretending to be wolves in order to simulate the effect of reintroducing the species, which it claims would be advantageous. The Siberian Times reported in March the proposal that wealthy tourists should be invited to pay $10,000 to shoot a wolf in Siberia, to make money for the government while culling the predators in an effort to reduce losses of reindeer and horses. Flipping up the visor on my flight helmet, I scanned the ground 800 feet below as the pilot throttled back the engine of the tiny, yellow two-seater plane and banked left. “There! Off to the left, under the wing, 9 o’clock!” My voice betrayed the adrenaline rush. It was the Mollie’s pack, less than a half-mile away from the den of the Junction Butte pack, and quickly closing the distance to their rivals. April is usually a quiet time for wolves in Yellowstone. The snow is melting in the low elevations, and rivers of green grass glow between the leafless, gray branches of aspens and the red stems of willows. Female wolves are choosing den sites—the hub of their family’s summer activity, and the school and playground for the new pups. But all that tranquility was gone as I watched the Mollie’s moving purposefully toward that den and the Junction Butte wolves sleeping nearby. In our previous issue, we discussed how important citizen science is, and how kids just like you can get involved. big problem for them. But wild wolves don’t have this luxury. Photographers in Yellowstone National Park act as citizen scientists by submitting their wolf photos to scientists who analyze them for evidence of mange. by Edward A. Fitzgerald, J.D. , Ph. 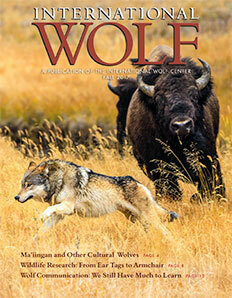 D.
the Department of Interior (Interior) acceptance of Wyoming’s wolf management plan. was needed; that designation allows the state to regulate the method, season and number of wolves taken on state land.